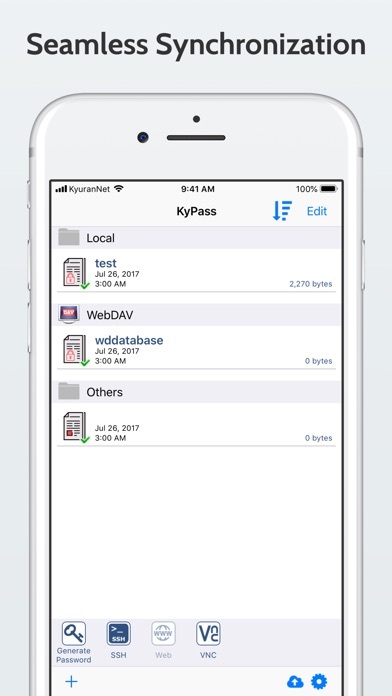 KyPass is an application for people with extremely high demands on secure personal data management. It uses the same database format than the open source software KeePass Password Safe. Your database could be synchronized (and be available offline): • with iCloud Drive, • with Dropbox, • with OneDrive (and OneDrive for business), • with Box, • with Google drive, • with SFTP, • or with any WebDav compliant cloud service. KyPass saves many different information (user names, passwords, urls, comments, ...) in one single database. The entries are sorted in groups. The integrated search function allows to search in the complete database. UNIQUES FEATURES IN THIS NEW VERSION • Treeview (especially on iPad) • VNC Viewer inside the app • SSH Viewer inside the app • Full Field References support • Full history support (View & Maintain History of entries) • Full Recycle-Bin Support • Folder selection in Dropbox, WebDav • Full attachment support (read, write) AND ALSO • Cloud Supports (Best way to keep multiple devices in Sync with the same information) • Safari Integration (and some common 3rd Party like iCab etc.) 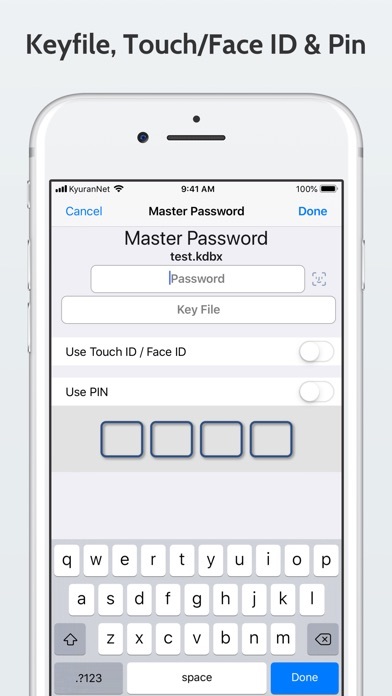 • Password Generator with Advanced features like prevent look alike characters • KDBX4 Support (Introduced with Keepass 2.35 see http://keepass.info/help/kb/kdbx_4.html) • External Keyboard support • Webdav local browser to import directly into KyPass without need for a cloud • Download database from URL • Touch-ID Security or Pin Code: Database password can be saved to the iOS Keyring so you don't have to type long passwords • One Time Passwords • Barcode exchange of entries • All entry informations (including last changed date and expiry) KyPass is now powerful enough the replace your desktop application! KyPass is also the most complete iOS version with a lot of feature not available in our competitors. Ob diese Anwendung sicher ist kann ich nicht beurteilen, ob die iCloud-Synchronisation, wie in anderen Bewertungen geschrieben, defekt ist oder die Nutzer es nur nicht beherrschen kann ich nicht beurteilen. Aber was ich beurteilen kann: Eine Verwendung durch einen EDV-Laien ist absolut UNMÖGLICH. Es existiert keine Hilfedatei, keine Schritt-für-Schritt Beschreibung und auch sonst keine Unterstützung. Nur ein Forum in Englisch, welches gleichfalls nicht wirklich hilfreich ist. Schade, daß ich den Kaufpreis nicht für etwas nützlicheres gespendet habe. Just installed the new version on my device. It’s always crashing when I try to type in the master password or use Touch ID. I’m running iOS 12.2. I really like version 3 and that version is still running smoothly on the same device. Beste KeePass Umsetzung für iOS. Beherrscht (fast) alles und das gut. Hat leider ab und zu mit kleinen Schwierigkeiten zu kämpfen, die aber meist sehr schnell gefixt werden. Select ´Edit´, mark a kdbx file, select ´Delete´ and ´Ok´ and nothing happens. All ok now in v4.5.1. Thanks for the fix! Great app, but since last update crashes when I try to add a new entry. That's a key functionality and needs a quick fix. Jedesmal wenn ich einen Eintrag öffnen möchte, egal ob von der Suche oder der Liste, stürzt die App ab. Kein Kommentar. Leider funktioniert die neue Version nicht so, wie sie soll. 1.) Abspeichern eines SSH-Eintrages APP wird beendet 2.) Anzeigen der verdeckten Passwörter Bildschirmhelligkeit (!) wird verringert Werden die Passwörter wieder verdeckt, wird die ursprüngliche Helligkeit wieder hergestellt... Dies scheint eine sehr frühe Beta zu sein. Is their any issue at the moment because I can’t access my database anymore? I didn’t change anything. On my local computer everything works fine, though. Edit: works in the new version! Thanks!